The deer in my neighborhood are getting much to comfortable with humans. These two were just laying around near the back of my yard. As I scrambled to find my tripod (it was late, so there was no way this could be taken hand-held), they just hung out. I spent about 5 minutes shooting, moving closer and closer to see what they would allow me to do. They were very still, allowing for this 300mm shot at 3 seconds duration to come out pretty crisp. Great moment caught, not easy to do with wild game. 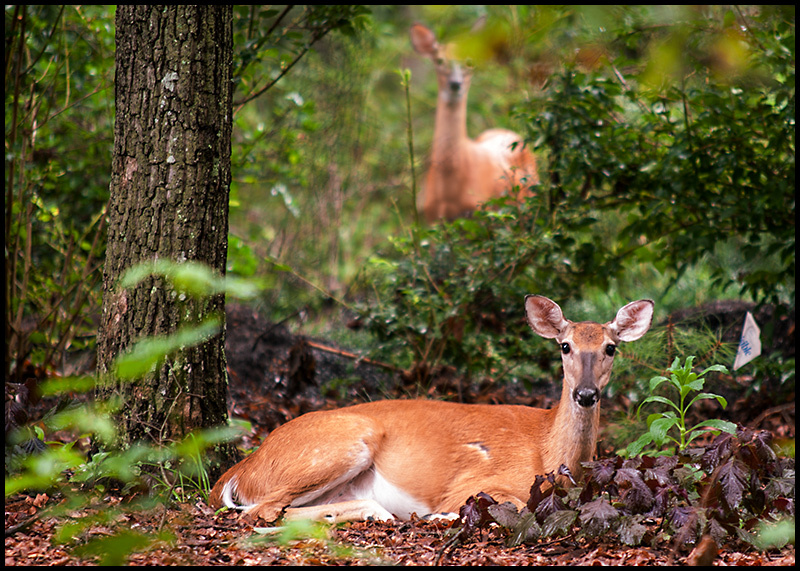 Pity there's a piece of plastic or paper in the bushes to right of foreground deer (behind it's left ear) that really spoils it for me. Proudly hosted by Sargasso Networks. Current Server Time: 04/22/2019 04:45:16 PM EDT.